Dang It! (because I'm trying to convince my two and four year olds to stop swearing, so should the mama that they're learning from) The day I start blogging again--full of fresh ideas and a week worth of crafting to post-- my camera--already with it's fair share of duct tape holding it together-- up and quits on me. I suppose I cursed myself by speaking so unkindly about the damn thing for so long. 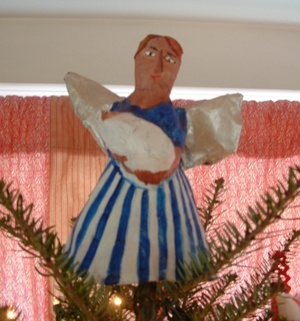 So, until a special Solstice fairy makes a new one appear next week (please, please, please??! ), I'm left creating posts around the few pictures I uploaded in the past few days. Bear with me! Since I can't get a good shot of the tree from top to bottom (see aforementioned camera angst), I'll just show you the top and bottom (hee hee). I love this paper mache piece by local artist Nance Parker. Her puppet work was a great inspiration for my own puppets (a few more are in the "craftiness" album..I've been feeling an itch to make more this winter). 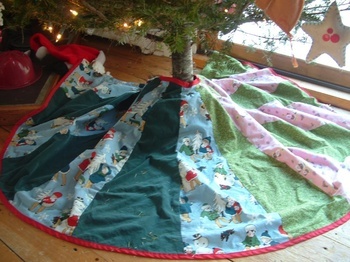 At the bottom of the tree is the tree skirt I made last week. Not so thrilling. I do love the fabric (the Alexander Henry winter children at play is so fun--It was leftover from making a Nappy Bag last year), but the skirt is kind of a wreck--not even going all the way around the tree (ran out of fabric). I guess that's what happens when you just start cutting fabric without a plan or measurements. Harumpfh. 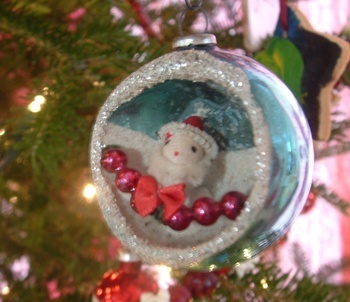 And then, this fun vintage ornament was in my Nana's "trash" pile when I went for a visit last week. Whew. I saved it just in time. I love these shadowboxy type old ornaments--I have a few others too that I shoud share. But you know, no camera (have I mentioned that?). 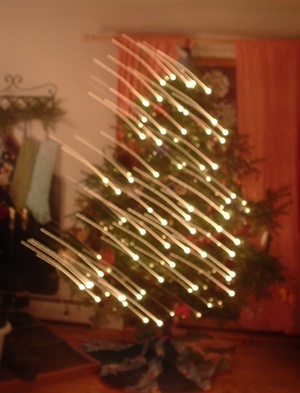 And here's what our tree looks like after a vodka and tonic (okay, two).